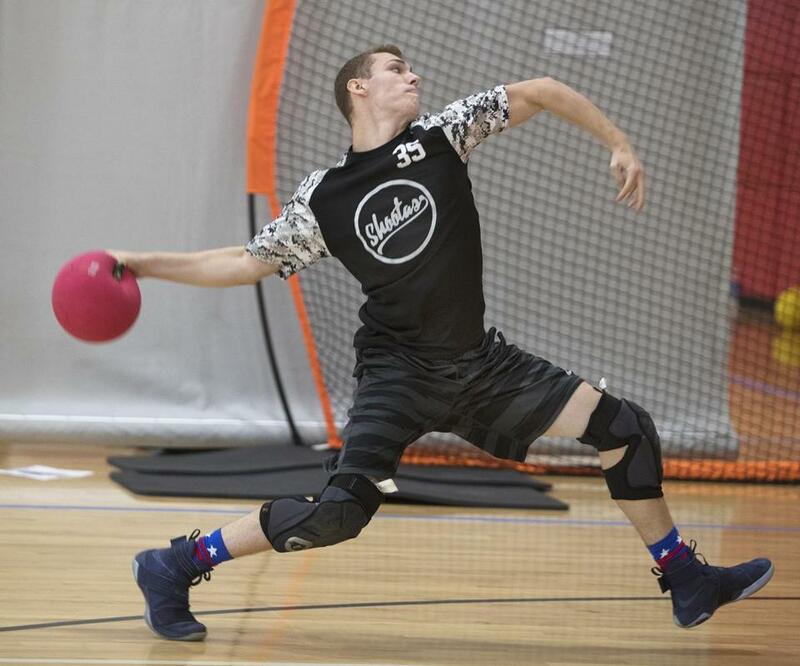 Michael McGee rears back and lets it fly at the Elite Dodgeball National Championships. Thwack. Here comes a blast from the past. 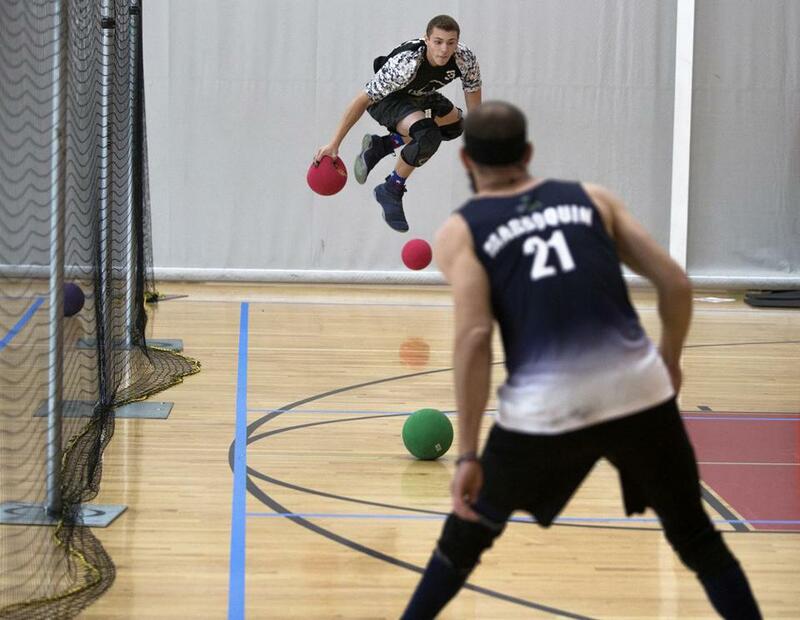 More than 360 of the best dodgeball players in the country competed in the Elite Dodgeball National Championships recently at Boston University. Picture elementary school kids, now grown up and with adrenaline flowing through their veins, slinging that red rubber ball toward each other at up to 80 miles per hour. It may not be politically correct, but participants say the three-day tourney is all about competition and having fun. He said his team has made more than $125,000 in prize money from a single tournament, but his share averages out to only about $8,000 a year. After each day of the three-day Boston tournament, the 39 men’s teams and 16 women’s teams partied together at night — win, lose, or draw. “You have a bad day at work, you hit some people, you catch some people, you make friends, you have a drink together, and there’s no better feeling,” said Marchbanks, who played baseball and football and ran track in high school. Vince Marchbanks snags a ball that bounced off his chest, eliminating an opponent. Not only do players have to be quick and agile to win, they must have their heads on a swivel to survive on the 50-by-25-foot court. 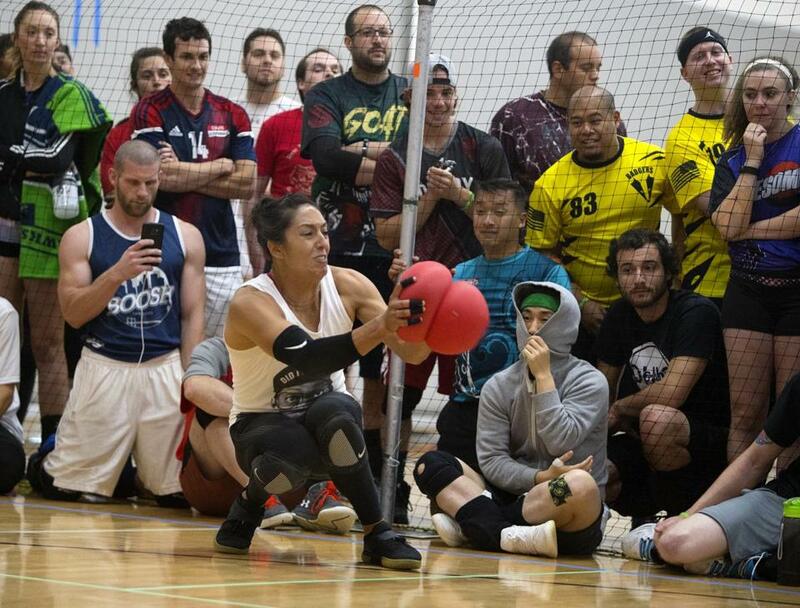 “There’s not another sport where you have six members on each side and six objects to keep track of,” said Mark Acomb, CEO and owner of Elite Dodgeball. Eyeglasses are prohibited, just in case of a head shot. Agility is a necessity when it comes to dodging the ball. 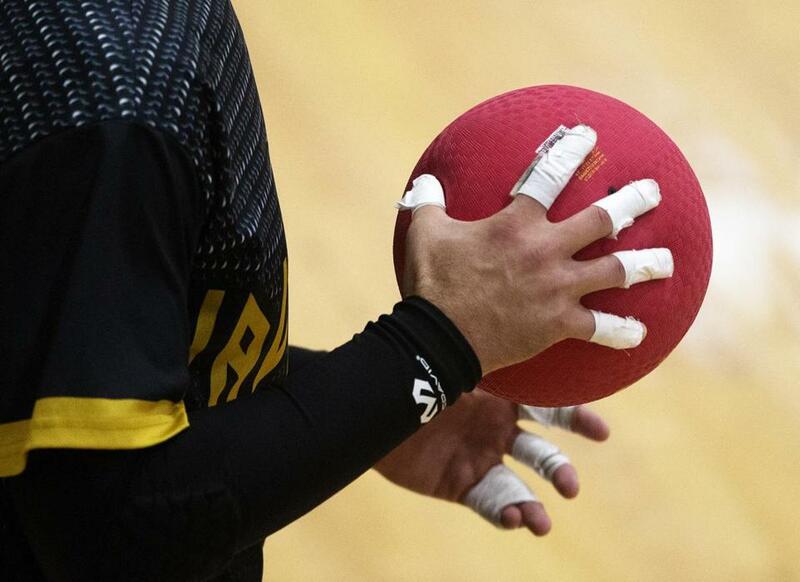 There were no serious injuries during the tournament; typically there are a few broken fingers and several ball-tattoo souvenirs left on players’ chests. The men flash them like badges of courage. Bragging rights are more important than the $9,000 in prize money. Finger injuries are a hazard of the game. Acomb has mixed feelings about the film. 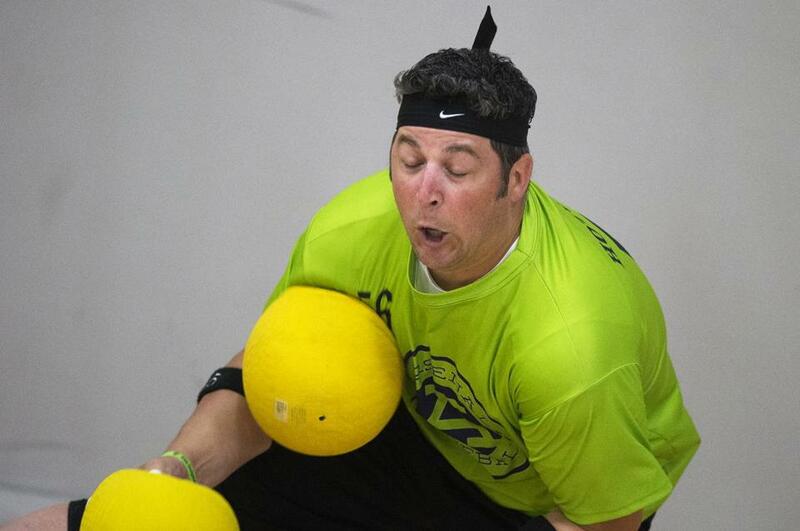 Marchbanks is still upset with “Dodgeball” stars Ben Stiller and Vince Vaughn. He looks down at his taped, twisted pinkies and explains why. He also is defensive with those who see dodgeball as a child’s game. 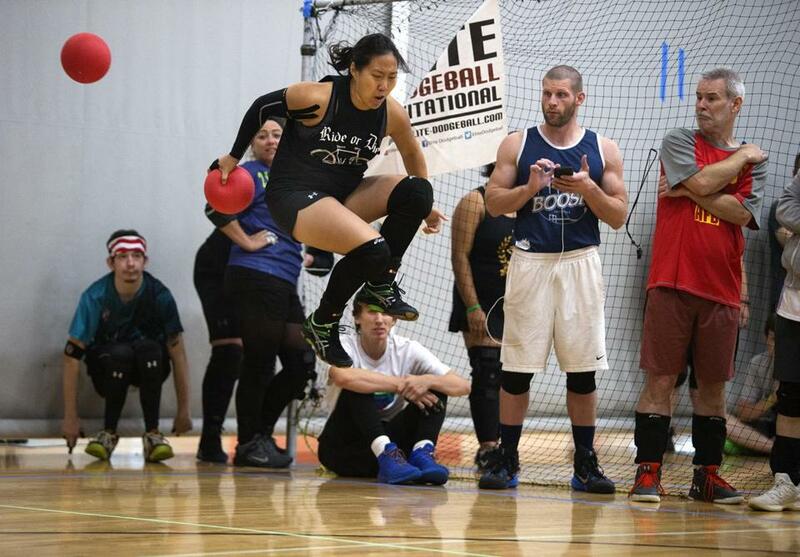 Acomb, though, says dodgeball is about teamwork and becoming a family, not bullying. A player gets nailed — and he is out. Tournament organizers were hoping there would be a one-on-one, east-vs.-west showdown between the veteran Marchbanks and local hotshot Michael McGee, an 18-year-old baker at the family-owned Modern Pastry in the North End. Marchbanks captured the top prize in the showdown, but McGee impressed many by finishing third nationwide. McGee said trash talk is rampant, but everybody is friends and respects each other at the end of the day. McGee’s delivery looks like Pedro Martinez’s, and he is built the same wiry way. He says he has overcome a variety of issues to get here, including anxiety, dyslexia, and learning disabilities since his middle school years. 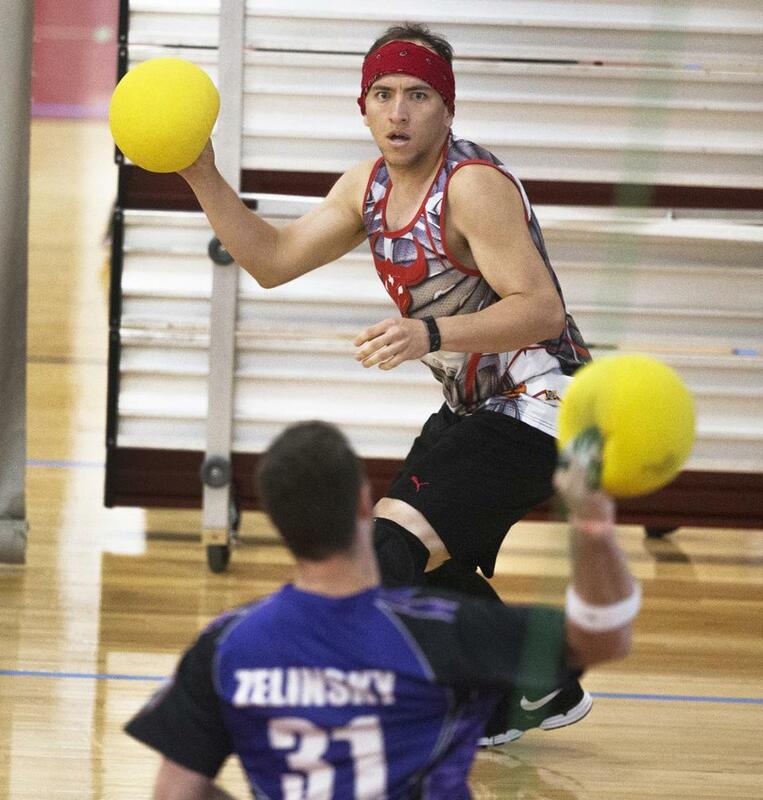 He started playing dodgeball at a local Sky Zone five times a week. 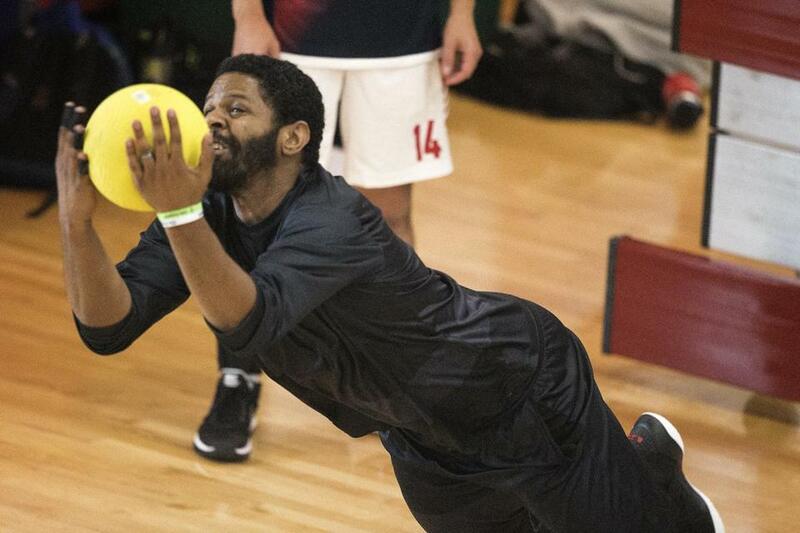 “Dodgeball was the thing that brought me back,” he said proudly. 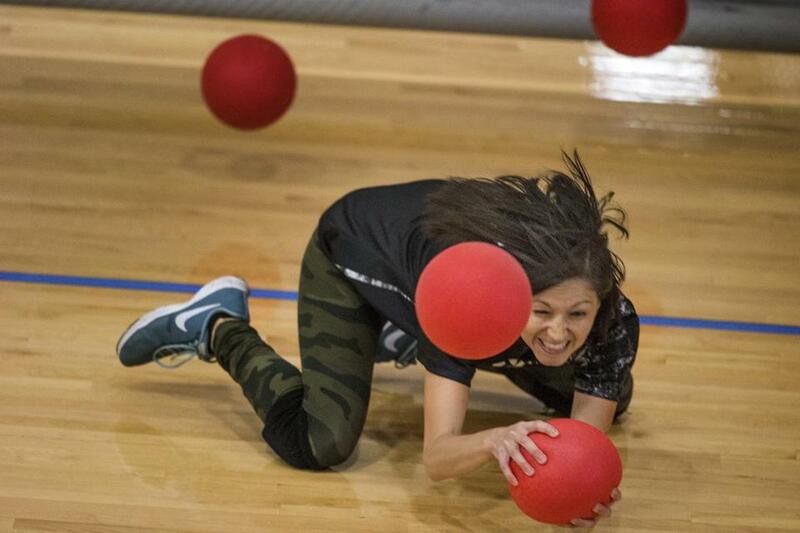 His mother, Sara, a cancer survivor who worried more about her son than herself, said that dodgeball was the main ingredient in his recipe for happiness. 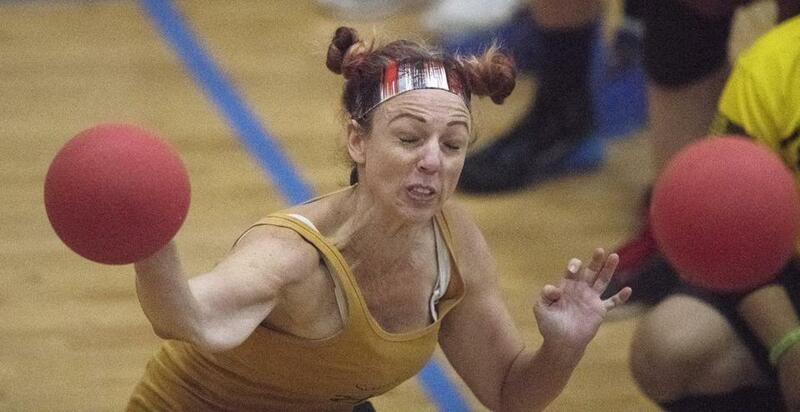 “Dodgeball saved his life,” she said. Objects can be coming from several directions at once. Michael McGee (rear) tunes up for a one-on-one showdown. This player gives and gets at the same time. 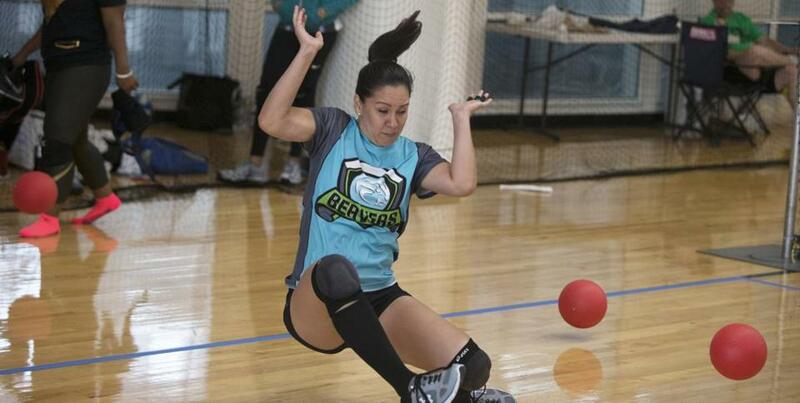 A player uses one ball to block another. There were 16 women’s teams in the tournament at BU. 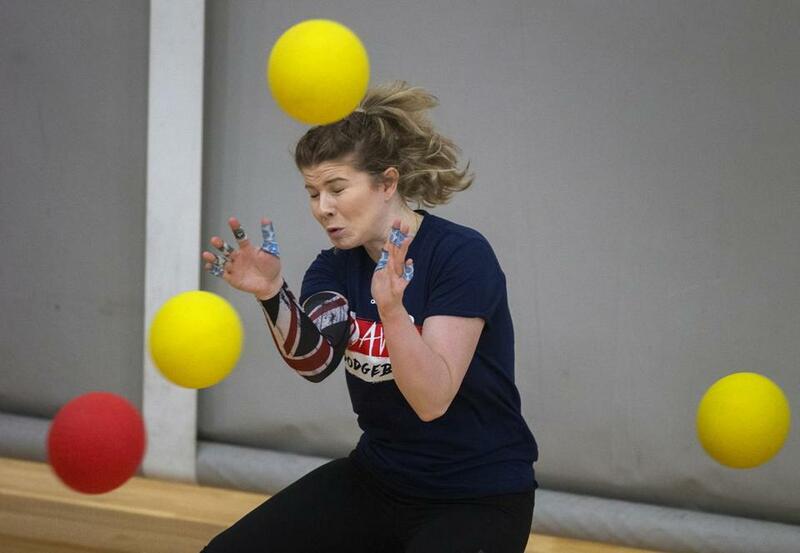 A player clutches one ball while dodging three.